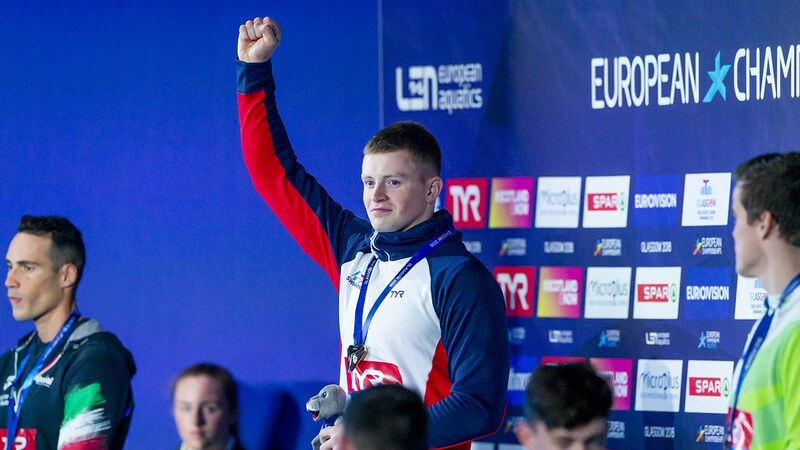 Adam Peaty cruised to his third European Championships 2018 gold medal and said it helped right his wrongs from earlier in the year. Peaty clocked a championship record 26.09 to win the 50m Breaststroke title by 0.70 seconds from Italy’s Fabio Scozzoli – and he was only 0.14 seconds outside his own world record of 25.95. It was his 11th European Championships gold medal and Peaty said it put the record straight after he missed out on top spot in the 50m Breaststroke at the Commonwealth Games on the Gold Coast earlier this year. Peaty could land a fourth gold medal of the Glasgow 2018 championships tomorrow when he goes as part of the Men’s 4x100m Medley relay team. Victory would mean he would be a quadruple gold medallist for the third consecutive European Championships. He said: “I tried to right my wrongs and prove that I can get near that world record. Maybe next year, I’ll touch it again. “I’ll chill out now, rest down, get a massage and absorb that. I’ll enjoy this but not too much as I still have a job to do tomorrow. “It’s three out of three at the moment and hopefully that streak will continue. I’m trying to enjoy it, and hopefully I will have a tussle on my hands tomorrow. Meanwhile, Freya Anderson finished fourth in the 100m Freestyle at the Tollcross International Swimming Centre. She finished in a European junior record time of 53.61 and was only 0.26 seconds behind France’s Charlotte Bonnet who took the bronze medal in 53.35. Sweden’s Sarah Sjoestroem won the gold medal after clocking 52.93, with Holland’s Femke Heemskerk taking the silver in 53.23. Siobhan-Marie O’Connor also finished just outside the medals as she touched home fourth in the 200m Individual Medley. O’Connor clocked 2:10.85 and was only 0.02 behind third-placed Maria Ugolkova, of Switzerland, who finished in 2:10.83. Aimee Willmott finished seventh for Great Britain in a time of 2:13.13. Meanwhile, Ben Proud set a new British and championship record as he qualified fastest for tomorrow’s 50m Freestyle final. Proud clocked 21.11 to finish more than half-a-second ahead of Poland’s Pawel Juraszek (21.67). It made him the third-fastest swimmer ever over the distance and he hinted that he could probably go even quicker in the final. Proud said: “It felt good. I was relaxed but 21.11 is a great time. There are one or two things I want to fix but the final swim is all about medals. “Before this race, I physically felt a lot more relaxed and that is something I’ll try and do tomorrow night – just relax and see what happens. I’ve got nothing to lose now. Imogen Clark broke her own national record as she qualified for the 50m Breaststroke final in a time of 30.04. She said: “I’m so excited for the final – it makes my belly tingle thinking about it but in a good way. Meanhwhile, James Guy progressed to the final of the 100m butterfly in fifth place after coming second in his semi-final.